The ’90s served as a period for glorious invention and reinvention of Nike Basketball footwear. Bold experiments in style and innovation brought us classics, with staying power. Perhaps, no sneaker better captures that sense of nostalgia than the Air Flightposite – a former hardwood classic turned urban staple that teeters the line between street and tech. 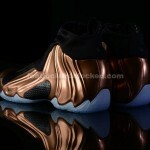 This Saturday, the Air Flightposite returns in a sleek ‘Copper’ and black colorway that will have you standing out on or off the court. 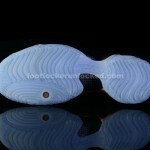 If you’re interested in picking up a pair check out our release details below. 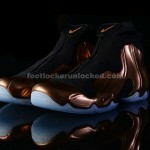 In partnership with mall management, SELECT Foot Locker and House of Hoops by Foot Locker stores will implement a sweepstakes ticket procedure* in order to purchase the Nike Air Flightposite ‘Copper’ (on sale 9/27/14 for $ 220). The sweepstakes tickets will be given out on Monday, September 22nd and Tuesday, September 23rd. If your ticket number is selected, you will be notified by phone on Wednesday, September 24th or Thursday, September 25th. These procedures are for SELECT STORES only. To find out which store near you will carry the shoe and if that store will implement the sweepstakes ticket procedure, please visit the Foot Locker Launch Locator. 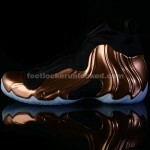 This release will be available on Footlocker.com starting at 8:00 a.m. EDT on Saturday, September 27th. Print article This entry was posted by hhcblog on September 21, 2014 at 4:02 pm, and is filed under Footwear. Follow any responses to this post through RSS 2.0. You can leave a response or trackback from your own site.